James Jordan, also referred to as James Jordan Junior, was born on June 24, 1768 in Virginia and died on November 16, 1846 in Cabell County, (West) Virginia. He married (1) Mary (last name unknown) circa 1795 probably in Greenbrier County, (West) Virginia. Mary was born circa 1779 and died on October 20, 1809. James also married (2) Peninah “Penny” Lee, in 1810 in Cabell County, (West) Virginia. Peninah was born circa 1780 and died November 2, 1849. James and both of his wives are buried in the old Jordan Graveyard, Cabell County, West Virginia. 🌳 James first appears on Greenbrier County Tax records in 1795 around age 27, suggesting that he was being counted in his father’s household before that time and indicating that he married his first wife Mary around this time. Both James Senior and James Junior appear on Greenbrier Tax lists until 1798, then move to the Kanawha County Tax lists in 1801. The 1801 Kanawha Tax list identifies James Jordan Junior as living in the Mud River area, along with James Jordan Senior, William Jordan and John Jordan. 🌳 In March 1813, James Junior received 125 acres of land on the Mud River from James Jordan Senior. This transfer was one of four gifts comprising most of the land James Senior had taken possession of when he first moved to Kanawha County. At least two of the recipients (Andrew and Jonathan), and perhaps all four (including James Jr. and John), were already living in their own homes on this land. These 1813 transfers probably indicate that James, who was getting on in years, was either beginning to pass his worldly goods on to his sons or was formally transferring ownership of land that he had already given them years before. Either way, these transactions provide solid evidence that all four recipients—James Jordan Jr., John Jordan, Andrew Jordan and Jonathan Jordan—were James Jordan’s sons. March 15, 1809 – Survey for James Jordan Junior of 98 acres in Kanawha (Cabell) County on the west side of Mud River adjoining and above a survey of one thousand acres made for John P. Duvall on which James Jordan now lives. Warrant #19,193 issued September 6, 1783. Patent signed by James Barbour, Governor of Virginia, on August 22, 1812, and delived to Mr. Jno Morris Jun. on May 20, 1813. March 4, 1813 – James Jordan Senr. sells for $1 to James Jordan 125 acres in Cabell County situated on the Mud River above and adjoining the Widow Sanders‘ land. Recorded April 16, 1813 by Edm’d Morris, Clerk of Cabell County. 1820 Cabell County, Virginia – James Jordan. 1830 Cabell County, Virginia – James Jordon. 1840 Cabell County, Virginia – Possibly listed in the household of son-in-law Samuel E.O. Wilson. Greenbrier County, Virginia. 1795 to 1798 (see Greenbrier County Tax lists). Kanawha County, Virginia. 1801, 1802, 1806 and 1807 (see Kanawha County Tax lists). 1. Thomas Lee Jordan was born circa 1815 in (West) Virginia and died in 1878 in Jefferson County, Kentucky, Kentucky. Thomas married (1) Malinda Killgore, daughter of Thomas Kilgore and Hettie Sanders, before 1840 in (West) Virginia. Malinda was born on July 4, 1822 in Virginia and died on January 2, 1855. She is buried in Killgore Cemetery, Cabell County, West Virginia. 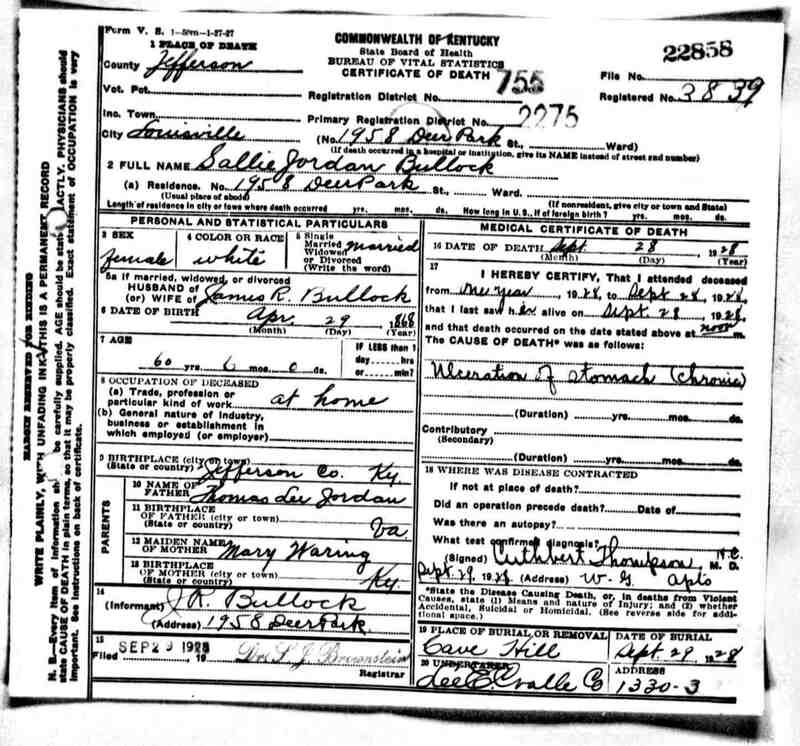 Thomas married (2) Eliza F. Gallaher, daughter of James Gallaher, on November 15, 1855, in Cabell County, (West) Virginia. Eliza was born on August 24, 1820 in Cabell County, (West) Virginia, and died on August 28, 1856. She is buried in Spring Hill Cemetery, Cabell County, West Virginia. According to the History of West Virginia and the People, Chapter 29, the town of Ceredo, West Virginia, was built on land originally owned by Thomas L. Jordan. Thomas owned a large estate on the Ohio River, which he sold after the Civil War, before moving to Jefferson County, Kentucky. Thomas married (3) Mary L. Waring, daughter of Bazel Waring and Tabitha Mackoy, on October 28, 1858, in Greenup County, Kentucky. Mary was born in 1834 in Kentucky and died in 1879 in Kentucky. Thomas and his third wife, Mary, are both buried in Middletown Cemetery, Jefferson County, Kentucky. 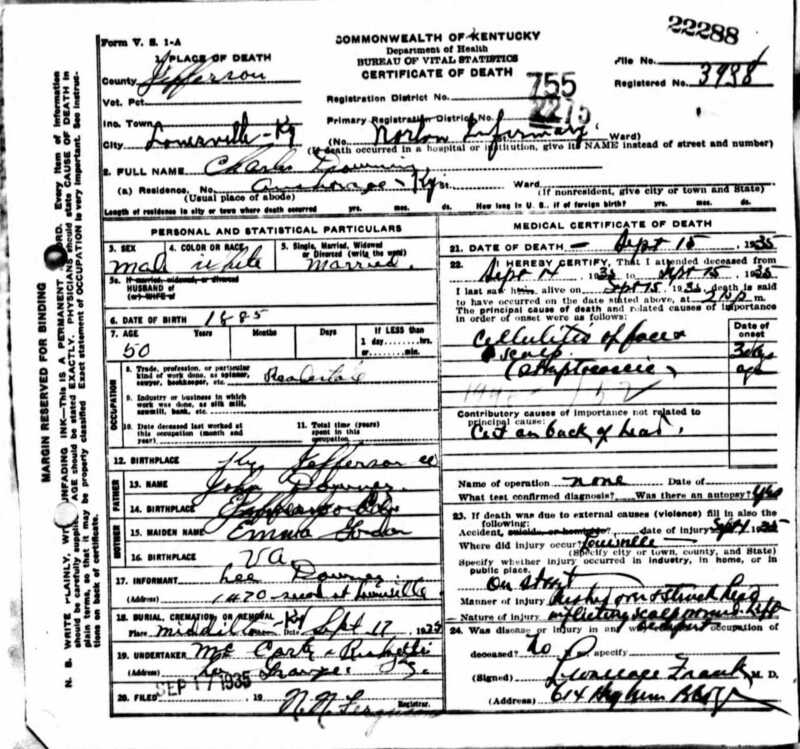 Thomas is found in the censuses of 1840-CabellVA, 1850-WayneVA, 1860-WayneVA, and 1870-JeffersonKY; he is probably also in 1820-CabellVA and 1830-CabellVA in the household of James Jordan. 1.1. James C. Jordan was born on January 8, 1843 and died on January 15, 1843. He is buried in Killgore Cemetery, Cabell County, West Virginia. 1.2. Robert C. Jordan was born on July 3, 1846 in Ceredo, (West) Virginia, and died on February 27, 1916 in Louisville, Jefferson County, Kentucky. He is buried in Middleton Cemetery, Jefferson County, Kentucky. He never married. 1.3. 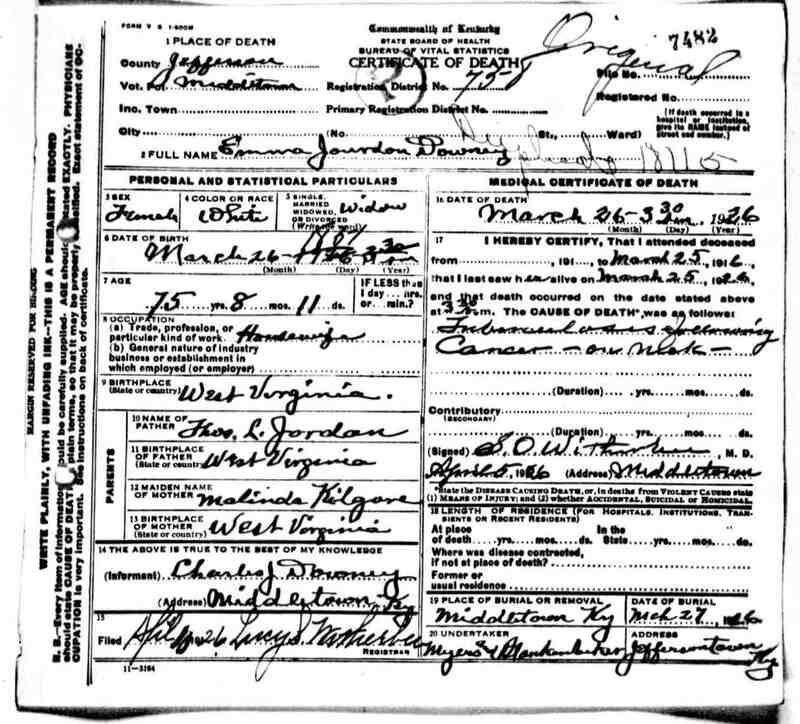 Emma A. Jordan was born on July 15, 1849/50 in (West) Virginia, and died on March 26, 1926 in Jefferson County, Kentucky. She is buried in Middletown Cemetery, Jefferson County, Kentucky. She married John Charles Downey, son of John Downey and Ruth Owens, circa 1876. John was born in Kentucky on February 24, 1850, and died on January 14, 1923, in Middletown, Jefferson County, Kentucky. 1.4. Edward Waring Jordan was born in March 1860 in (West) Virginia and died on June 5, 1925 in Jefferson County, Kentucky. He is buried in Middleton Cemetery, Jefferson County, Kentucky. He never married. 1.5. Sallie Jordan was born on April 29, 1867 in Jefferson County, Kentucky, and died on September 28, 1928 in Jefferson County, Kentucky. She married James Robert Bullock circa 1908. James died on October 16, 1949. Both James and Sallie are buried in Cave Hill Cemetery, Jefferson County, Kentucky. 1.6. Mary Jordan was born on May 4, 1871 in Kentucky and died on May 4, 1939 in South Crestwood, Oldham County, Kentucky. She is buried in Floydsburg Cemetery, Oldham County, Kentucky. She married Franklin Talleyrand (Tal) Pearce, son of Bernard Pearce and Margaret Pinell, circa 1905. Franklin was born in March 1873 and died in South Crestwood, Oldham County, Kentucky on January 3, 1935 of a gun shot to the head. He is buried in Duncan Memorial Cemetery, Oldham County, Kentucky. 1.7. Dr. James Basil Jordan was born on August 1, 1873 in Middletown, Kentucky, and died on August 5, 1948 in Middletown, Kentucky. He is buried in Middletown Cemetery, Jefferson County, Kentucky. He married Ada Creel Miller on April 28, 1904. 2. Sarah Jordan was born in 1811/1812 in Virginia and died on March 4, 1888 in St. George, Kansas. She married Samuel Engle Oakford Wilson in Cabell County, (West) Virginia on October 18, 1831. Samuel was born on April 20, 1808 in Maryland and died November 13, 1869 in Kansas. Both Sarah and Samuel are buried in St. George Cemetery, Pottawatomie County, Kansas. Sarah Jordan is found in the censuses of 1850-WayneVA, 1860-PottawatomieKS, 1870-RileyKS, 1880-PottawatomieKS; she is probably also in 1820-CabellVA and 1830-CabellVA in the household of James Jordan and 1840-CabellVA in the household of Samuel E.O. Wilson. 2.1. Thomas L. Wilson was born in 1831/1832 in Virginia and died in Kansas on April 15, 1880. He is buried in St. George Cemetery, Pottawatomie County, Kansas. 2.2. Allen Wilson was born circa 1835 in Virginia and died in Kansas after 1870. He is buried in St. George Cemetery, Pottawatomie County, Kansas. 2.3. Louisa Wilson was born on June 30, 1838 in Virginia and died in Kansas on December 15, 1900. She married William Wallace Emmons in St. George, Pottawatomie County, Kansas Territory on March 28, 1850. William was born on June 1, 1832 and died on July 21, 1912 in Kansas. Both Louisa and William are buried in St. George Cemetery, Pottawatomie County, Kansas. 2.4. Charles L. Wilson was born on July 10, 1841 in Virginia and died in Kansas on April 29, 1900. He is buried in St. George Cemetery, Pottawatomie County, Kansas. He married Carrie Webster in Kansas. Carrie was born circa 1843 in New Hampshire. 2.5. Margaretta/Margaret Wilson was born in March 1844 in Virginia and died after 1860. 2.6. Malinda Wilson was born on November 18, 1847 in Virginia and died in Kansas on September 8, 1913. She married William Vail in Kansas. William was born on January 1, 1839 in New York and died on March 15, 1911 in Kansas. Both Malinda and William are buried in St. George Cemetery, Pottawatomie County, Kansas. 2.7. Morris L. Wilson (adopted) was born in January 1861 in Kansas Territory and died in 1934. He is buried in St. George Cemetery, Pottawatomie County, Kansas. 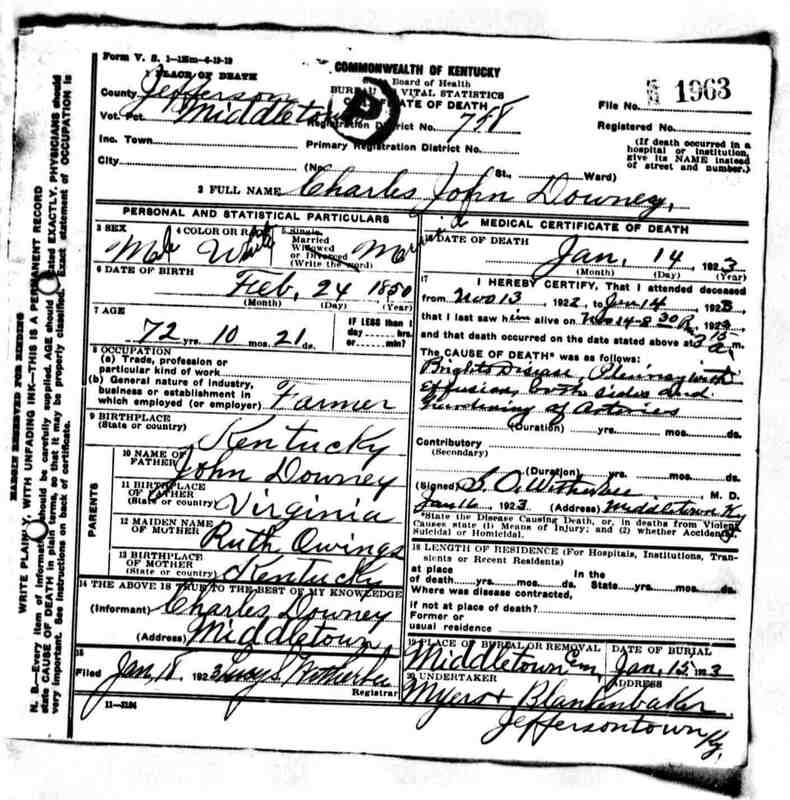 1 Date of James Jordan‘s death is taken from tombstone; his date of birth is calculated from his age given on tombstone (78 years, 4 months, 23 days). His death is also reported (without exact date) in a letter written on February 9, 1848 by Andrew Sexton to William and Catherine Jordan. Birth and death dates of James’ wives are taken from their tombstones (Mary aged 30 years at death, Peninah aged 69 years at death). Year of first marriage estimated from Greenbrier County Personal Property Tax (PPT) records; year of second marriage recorded in Cabell County marriage book. NB: Some family researchers mistakenly give James’ birthdate as May 8, 1763, assuming that he was the son of James and Sarah Stodghill Jordan of Goochland County, Virginia, whose birth was listed in the Douglas Register. For details showing why this family is not connected with the Goochland County Jordans, see Greenbrier vs. Goochland. 2 Records from the Penn Germania Genealogical Club identify Thomas as the son of James Jordan and Peninah Lee. The year and location of Thomas Lee Jordan‘s birth was taken from the censuses up to 1850; his tombstone gives his year of birth as 1820. Date of death taken from his tombstone. 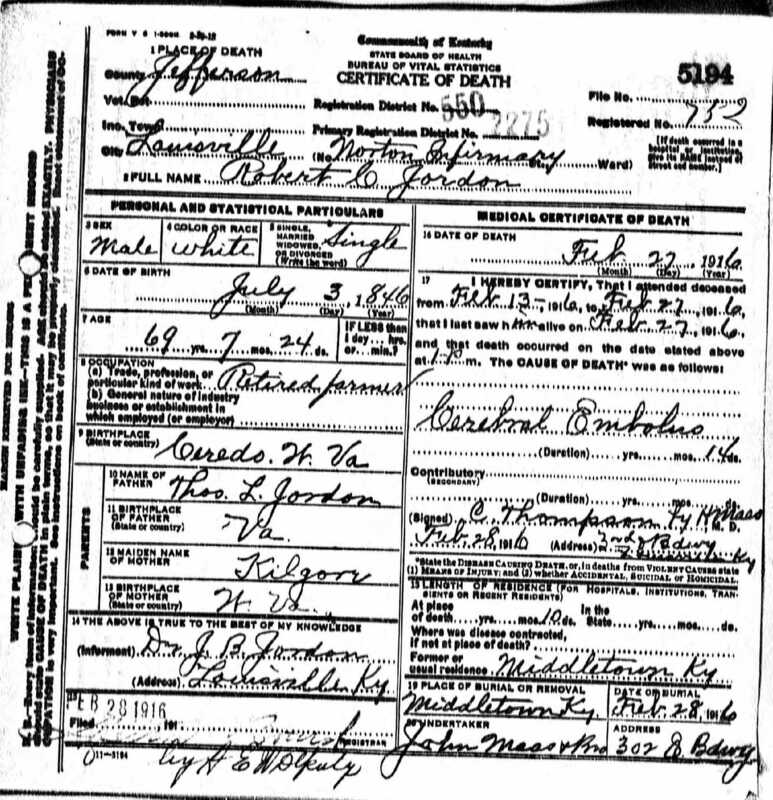 Malinda Kilgore Jordan‘s birth and death dates and confirmation of their marriage taken from her tombstone. 3 Cabell County records for the marriage of Thomas Jordan and Eliza Gallaher in 1855 confirm Thomas Lee Jordan’s father to be James Jordan. 4 Mary Waring‘s grandfather, Thomas Waring, served as a Second Lieutenant in Capt. Gaskin‘s Company of the 5th Virginia Regiment during the Revolution. 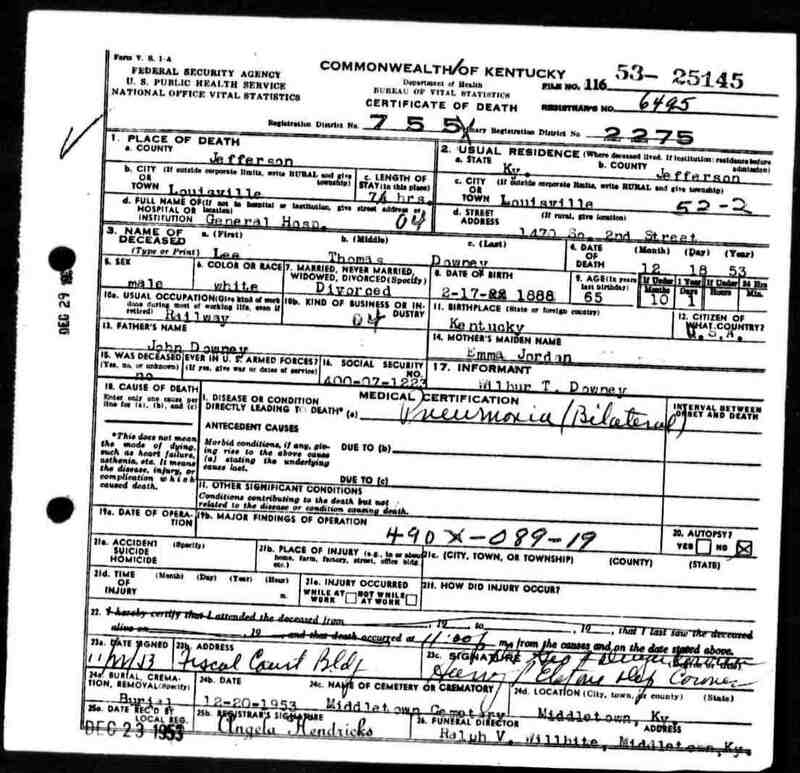 5 Thomas Lee Jordan‘s children’s dates and locations taken from census records; tombstones; Kentucky Death Certificates; S. Scheiwe, and Middletown’s Days and Deeds. 6 Sallie Jordan Bullock was member # 139774 in the Daughters of the American Revolution. 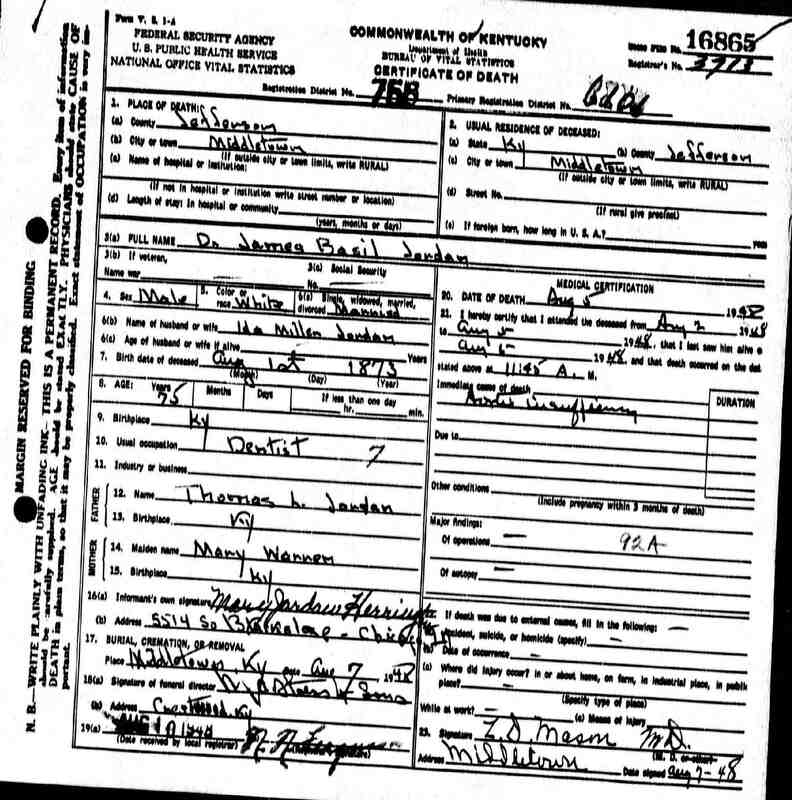 7 Birth and Death dates and locations for Sarah Jordan Wilson and her family taken from census records, Sarah and Samuel’s tombstones, and Sarah’s obituary in The Westmoreland Recorder. Records from the Penn Germania Genealogical Club identify Sarah as the daughter of James Jordan and Peninah Lee. Date and location of marriage taken from Penn Germania records, but I’ve not been able to find it in Cabell County records. Children’s dates and locations taken from census records, tombstones, and/or Pottawatomie County, Kansas marriage records.